The security identifier could not be resolved. Ensure that a two way trust exists for the domain of the selected users. The first thing I checked was the DNS Server. Issues like this are almost always DNS. Everything appeared to be in order. 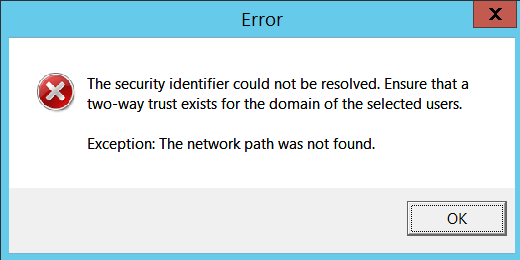 I checked ntdsutil to make sure that all roles were delegated to the correct servers. I went through Active Directory with a fine tooth comb. Everything was within normal parameters. Brainstorming, I thought that maybe the computer name was the issue. During deployment, I named this RDP server the same computer name as the previous terminal server. It was easy to test, so I created a local user account, disjoined the new server from the domain, renamed it, and rejoined it to the domain. It was not the problem. Then, I noticed that I could not ping “serverDC” without its domain suffix. Host not found. I didn’t have any problems joining to the local domain, so how could this be? Everything worked fine after this change was made. I did not even have to reboot! As always, I will do my best to answer any questions in the comments below.